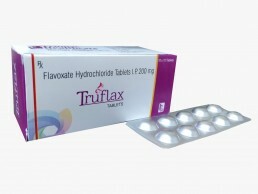 Trumac Healthcare is one of the leading Flavoxate Tablets Manufacturers Suppliers all over India. Flavoxate is used in the treatment and prevention of muscle spasms of the urinary tract. It can also be used to relieve symptoms which may occur as a result of surgery, cystoscopy or catheterization such as painful urination, excessive urination at night and the inability to control urine flow. Flavoxate is anti-spasmodic. It works by relaxing muscles of the urinary bladder and prevents frequent, urgent or uncontrolled urination, and relieves associated pain. In animal and human studies, flavoxate hydrochloride has been shown to have a direct antispasmodic action on smooth muscle fibres. The mechanism of action involves intracellular cyclic AMP accumulation and calcium blocking activity.